Hofbräu München’s citrusy hefeweizen is a light German wheat beer that’s excellent with soft, tangy cheeses. The nuttiness and hoppy flavor of Brooklyn Brewery’s brown ale pair well with mild cow’s-milk cheeses like this one. 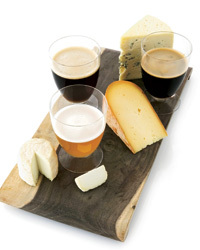 North Coast Brewing Co.’s chocolaty and deep Old Rasputin Russian is a hearty stout, perfect for stinky cheeses.